Last week I posted a suggestion that giving a harmonica is a good choice for the holidays or anytime. Harmonicas are relatively inexpensive and a lot of fun. I also included some youtube videos that could help a beginning harmonica player get started. This week I’m going to point you to more sources of harmonica instruction. If you or someone you know is just getting started in harmonica (maybe someone you gave a harmonica to) then these should help. 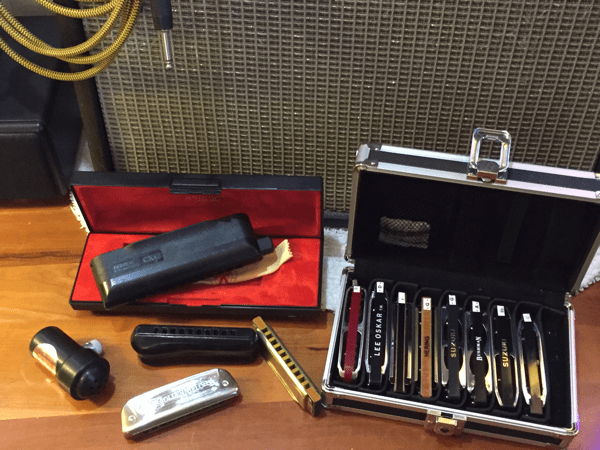 Some of these are for more advanced players — so really they’re for anyone who plays harmonica. I should add a big warning. I started trying to play harmonica in 1962 but it has never been my instrument. I’ve put the harmonica aside many times. I’m a guitar player. I can blow and bend and play crossharp, but I’m pretty poor at it. It’s still fun though. It’s probably time for me to dig out my harmonica collection and start playing again. There are many harmonica instruction videos on youtube and elsewhere but I’m going to provide you with references to three feeds you might want to subscribe to if you’re serious. Adam Gussow began performing with Mr. Satan as a young man. They were know as Satan and Adam and performed on the streets and elsewhere. Here’s an example of them playing from 1993. Here they are in 2014. Here’s an example of one of Adam Gussow’s instructional videos. This is one of his first – there are hundreds of videos now. Adam’s youtube feed is named KudzuRunner. Go there to subscribe. Annie Raines is best known as the partner of Paul Rishell, a guitarist. I mentioned Annie in my last post. Here’s another video of her playing so you can get a sense of who she is. Here’s an example of one of her instructional videos. You can subscribe to her channel at paulandannie (clearly not just instructional videos). Jason had been making videos for sometime to give back to the community. If you’ve never heard him, here’s an example of his playing. The following is one of his early instructional videos. The above was so as to not scare you with something like the following lesson on how to play fast. Jason’s channel is jasonricci. Go there to subscribe.